* 2. 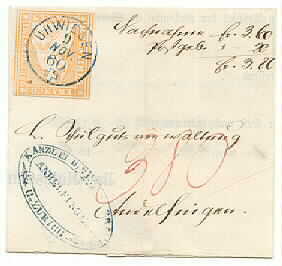 5 C black/red 1850 - well margined copy with grid cancellation nice small cover side cancelled "Geneve 22 MAI 51 11 1/2 M". Signed "v.d.Weid". Certificate : Hans P. Renggli, Switzerland. * 8 II and 9 II. 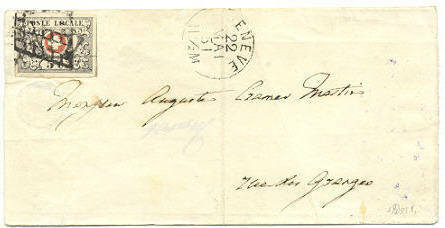 10 rp Rayon II and 5 rp Rayon I with grid cancellation on cover cancelled "Zürich 19 oct 52" in red sent to Luzern. * 14 and 16. 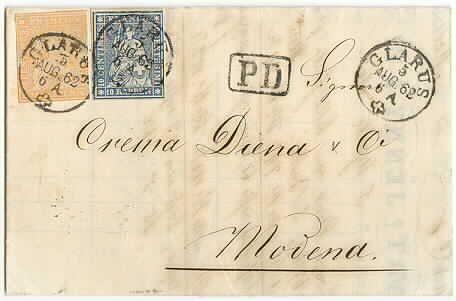 10 and 20 rp Helvetia - cancelled "Glarus 5 AUG 62" on beautiful invoice sent to Modena, Italy. Transit and arrival cancellations on back. * 16. 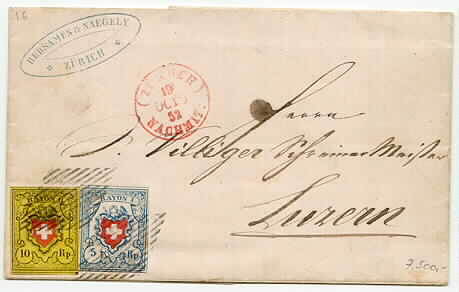 20 rp Helvetia 1860 - cancelled "Uhwiegen 9 nov 60" in blue on small cover sent to Andelfingen. Superb quality. * Air Mail stamp VI and 114. 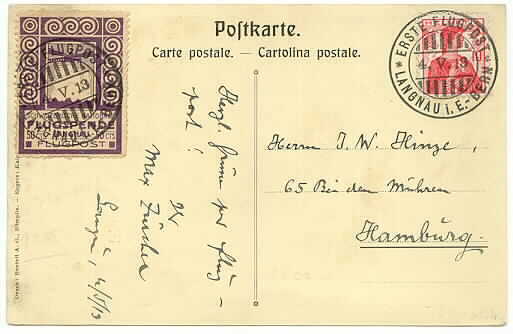 10 c Helvetia 1909 and 50 c Langnau - cancelled "Erste Flugpost Langnau I.E. - Bern 4.V.13" on special postcard sent to Hamburg.